Neo - Compact and intelligent! NEO proves that exceptionally good things come in small packages. Its compact size (it weighs just 9.7 oz. 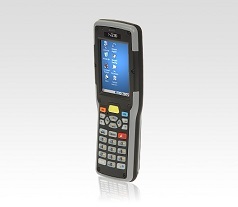 (275 grams)) coupled with a raft of features makes it perfect for the mobile workforce. Best suited for: Retail, Postal and Courier, Warehousing and Distribution, Supply chain, Arenas and sports venues. NEO may be small but don’t be fooled. It’s unbelievably rugged. Which means it’s never out of action. And productivity never dips.NEO may be small but don’t be fooled. It’s unbelievably rugged. Which means it’s never out of action. And productivity never dips. It’s bright, high-resolution colour display is angled towards the user. This makes it a dream to use – unlike the frustrating ‘scan, tilt and squint’ action of other devices. NEO can easily be expanded to incorporate new technologies, like RFID, as and when your apps demand it.